I am so glad this month is over! Rick’s mom had a stroke on Halloween and passed away early on November 3rd. I had talked to her for almost an hour the day before, and there was no hint of what was to happen. She was such a sweet lady, and a wonderful MIL. Rick and I stayed in Indianapolis until we had done all we could. Then we drove back to California in 3 days to be home for Alex on Thanksgiving. We are exhausted, but I felt I should post something explaining my absence. My in-laws moved to a cute 2 bedroom house when they retired. We were fortunate to find an estate service to handle clearing out the house and auctioning everything, including the house. I didn’t know services like that existed. 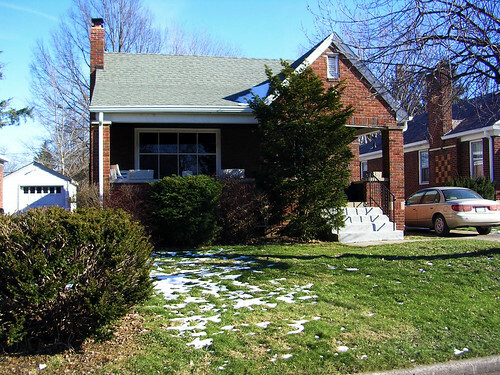 No one in the family lives in Indianapolis anymore and a vacant house is just asking for trouble. My MIL kept everything so nice it would be a shame to see the copper pipes ripped from the walls. I asked her to move in with us every time we talked, but she loved her home. Here are a few photos of her home. The kitchen was my favorite room. Lots of family stories were told at that table. It has been hard coming to terms that we lived so far away, and we should have visited more. This entry was posted on Monday, November 30th, 2009 at 3:00 am and is filed under Life. Tagged: Life. You can feed this entry. You can leave a response, or trackback from your own site. I’m so sorry for your loss. 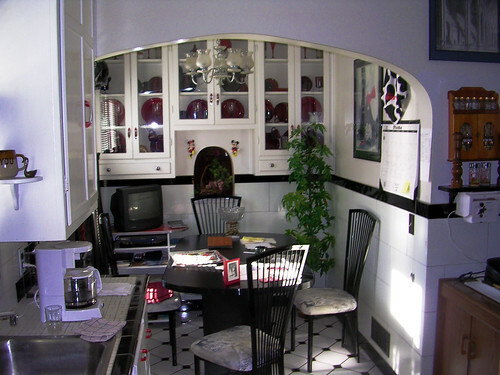 Your MIL’s black and white–with touches of red–kitchen is very pretty. 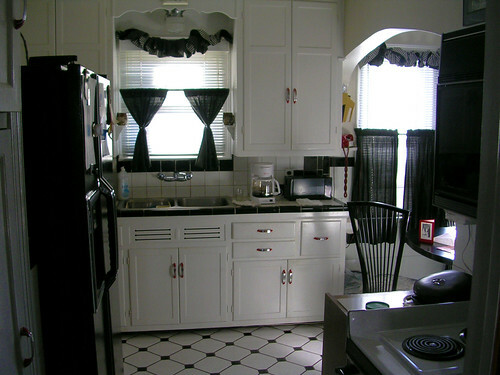 The kitchen is just gorgeous…lots of character and I’m sure lots of memories. I’m so sorry. I am so sorry to read that you had such a difficult month. I hope that you don’t worry too much about your perceived lack of visits – it sounds as if you did talk to her often. Families are so spread out these days – both my children live in different countries. The little house is very cute – I’m glad though that it is going to be taken care of, and soon will provide a home for somebody. My sympathies to you, your husband and family. I know you will treasure your memories. I am so sorry for your loss. I know it is a hard time. My MIL passed away on November 13, and it’s been tough.